Last month, there was a remarkable disconnect between what was being reported on BBC News outlets and what was concerning many members of the public on social media. The Health and Social Care Bill was passed by Parliament on 21st March, despite massive objections from many of those working in the NHS, and those members of the general public who were aware of the bill. Evidence of this concern was apparent from the fact that a petition with 486,000 signatures was presented to the Lords by Lord David Owen on 19th March, supporting his view that consideration of the Bill should be deferred until after the Risk Register had been published. 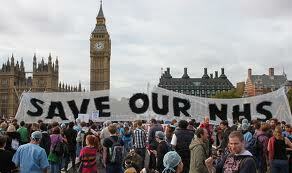 There had also been a rally on 7th March attended by thousands of NHS workers. During the month of March, when there was still an opportunity of killing the bill if the Liberal Democrats had come out against it, there appeared to be very little coverage of it by the BBC. Only after the Bill had been passed, did the BBC seem willing to run it as a news item. There has been a fair bit of commentary on the lack of coverage, with some suggesting there may have been a deliberate conspiracy to keep quiet because of political pressures and/or vested interests of BBC executives in private health providers. Thank you for contacting us regarding BBC News coverage. We understand you believe BBC News did not sufficiently report on the opposition to the Health and Social Care Bill. BBC News has reported extensively on the opposition to the Health and Social Care Bill across our news programmes and bulletins since the Bill was originally proposed. We have reported on the health, political and business dimensions of the debate during our flagship news programmes and news bulletins and have heard from politicians, NHS workers, public sector workers and members of the public alike, as well as from supporters of the bill. There have been numerous protests and demonstrations held in opposition to the Government’s proposals. Such shows of opposition have been varied in size and were spread across the different stages of the bill’s formation. We believe we have accurately and fairly reflected the nature of this opposition in our news coverage. While you were unhappy about the level of coverage given to this, the political opposition to the Bill culminated in the House of Commons emergency debate on 20 March. Accordingly, the Commons debate featured heavily in our news coverage on the day and was the lead story during our main news bulletins. The Health and Social Care bill has been one of the biggest UK stories over the past few months and we believe we have afforded it the appropriate level coverage in a fair and impartial manner, allowing viewers and listeners to make up their own minds on the matter at hand. We understand that you would like details of when opposition to the Health and Social Care Bill was covered by the BBC. Opposition to the bill has been covered on various programmes across the BBC, for example; Newsnight, The Daily Politics, Today and BBC News Online. Opposition was also covered on 'Newsnight' during a report on 9th March which looked at Liberal Democrat activist's plans to derail the bill and on the 13th March during a discussion on the future of the welfare system. A report on the 'The Daily Politics' broadcast on 13th March (at 14:09) highlighted opposition from Labour as well as the Royal College of GPs. Diane Abbott said health professionals were still opposed to the Health and Social Care Bill, which could be days away from becoming law. She said a future Labour government would overturn the act and "unpick the worst of the damage". Liberal Democrat spokesman Lord Clement-Jones said the bill was "going to get more acceptance". Sat 10th March, 0712-0714 Liberal Democrat activists will decide this morning whether Nick Clegg will face a vote on the health bill. The BBC's Robin Bryant explains why that could be bad news for the government. Weds 21st March, 0840-0853 The government's controversial plans to change the NHS have passed their final hurdle in Parliament after 14 months of opposition and changes in both houses. Professor Chris Ham, chief executive of the health think-tank The King's Fund, looks at what we left with now. So, if I have understood this right,during March, the Today Programme covered the story once, in an early two-minute slot, before the Bill was passed. Other items that morning included 4 minutes on a French theme park based on Napoleon, 6 minutes on international bagpipe day and 8 minutes on Jubilee celebrations.